During the cold winter months I crave the flavor orange! I mean REALLY crave it! I want oranges for breakfast, orange slices in my salad at lunch, orange chicken and fried rice for dinner, and orange sherbert or orange creamsicle pops for dessert every day! Must be my body's way of telling me to get more vitamin C! So with my orange cravings in full force, I decided to create a new cake flavor: orange creamsicle (coming soon!)! After coming up with a cake recipe I loved, I needed to figure out what to put on top! When I think of creamsicle flavor, I think of ice cream! So the frosting had to remind me of ice cream in some way. My whipped buttercream variety has a great ice cream-like flavor, but I was feeling lazy and didn't feel like cooking the ingredients. I wanted to make something that would be quick... like American frosting! So using the basic American frosting ingredients, I decided to use heavy cream as the liquid, and the result was a rich and creamy, thick, sweet, ice cream-like frosting! Check it out! 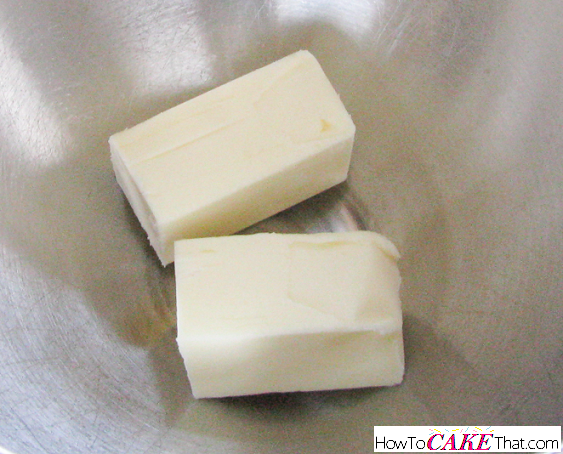 To begin this recipe, place 1/2 stick (2 oz) of unsalted butter in the bowl of a stand mixer. 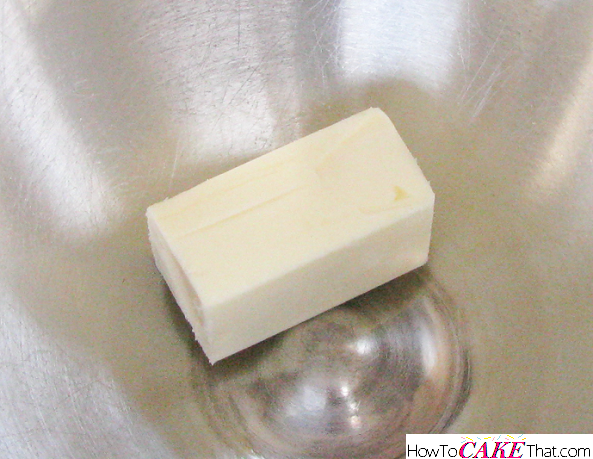 Next, add 1/2 stick (2 oz) of salted butter to the bowl. Add 1/2 cup of high ratio shortening to the bowl. Note #2: If you prefer not to use shortening, feel free to add 1/2 cup of unsalted butter in place of the 1/2 cup of shortening. 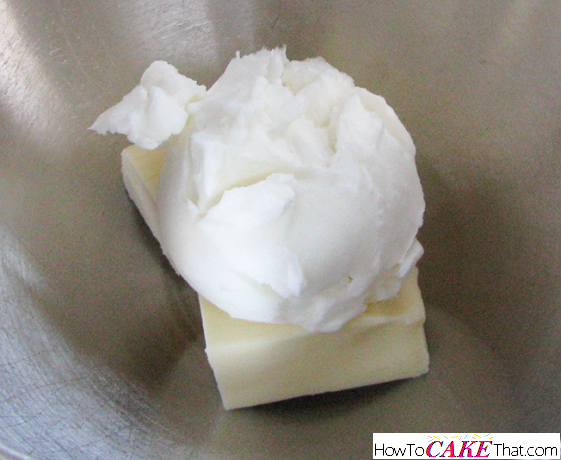 If you choose to use all butter, be sure to add the cream a little at a time at the end. 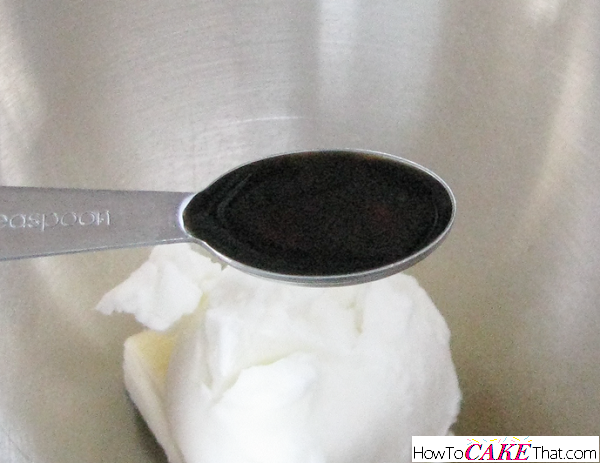 You may not need the full amount of cream listed in this recipe since butter is not as thick as shortening. 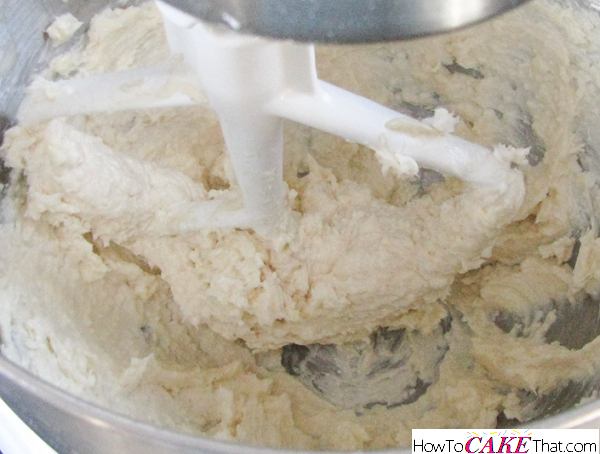 Fit stand mixer with a paddle attachment, and mix butter, shortening and vanilla together on low speed. 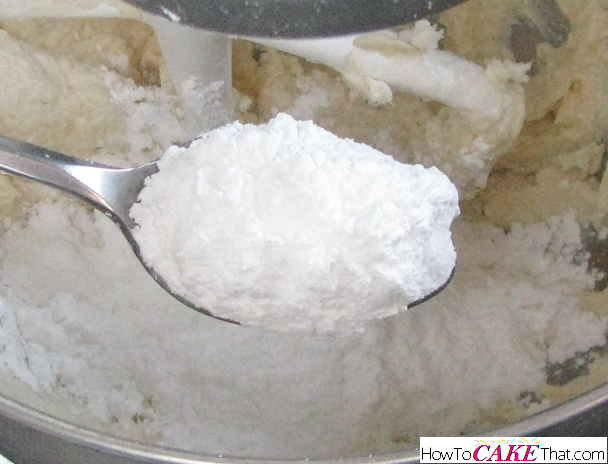 Turn mixer off and add 11 ounces of powdered sugar, a little at a time. Mix on low speed between each addition. 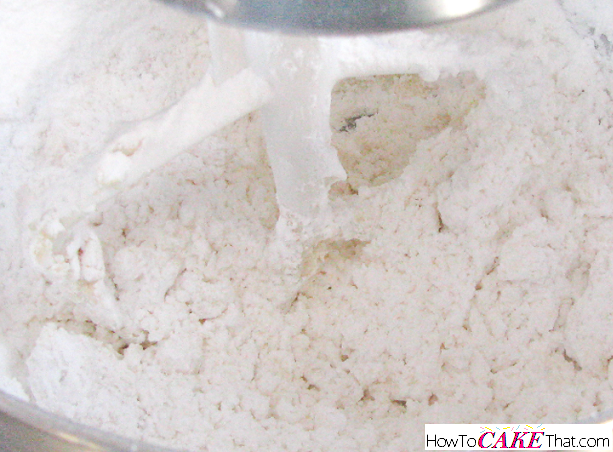 Mixture will appear dry and crumbly after all of the powdered sugar has been mixed in. Pour in 3/4 cup of heavy whipping cream and mix beginning on low speed until liquid is blended in enough to keep from splashing. 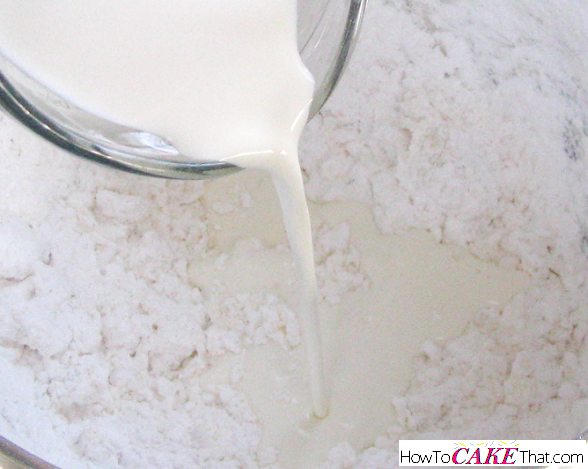 Once liquid is mixed, turn mixer on high speed and mix for 3 to 4 minutes, until mixture becomes fluffy. 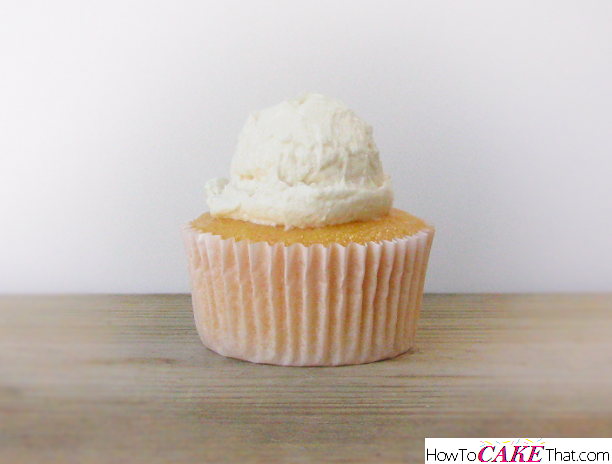 And that's how you make this Vanilla Cream frosting! I hope you have enjoyed this tutorial! God bless! !